^ Lorenzo Sciavicco, Bruno Siciliano. 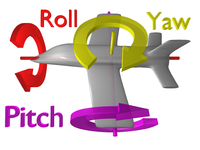 §2.4.2 Roll-pitch-yaw angles. Modelling and control of robot manipulators 2nd. Springer. 2000: 32. ISBN 1852332212. ^ 3.0 3.1 3.2 Whittaker, Edmund. A treatise on the analytical dynamics of particles and rigid bodies; with an introduction to the problem of three bodies. Cambridge University Press. 1917: 2–5.